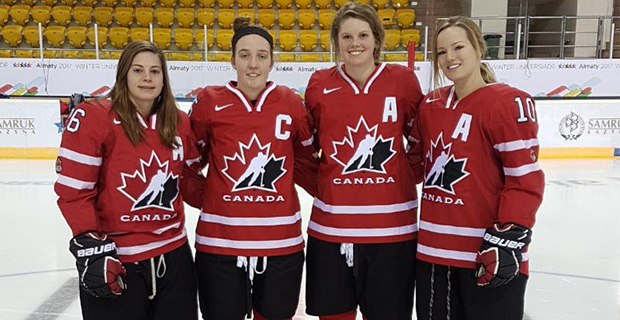 The Canadian women’s hockey team kicked off the 28th Winter Universiade with a 9-1 win over China. The roster consists of all-stars chosen from U Sports teams to play in the Universiade held in Almaty, Kazakhstan from Jan. 28 to Feb. 8. The Universiade is a biennial international multisport event open to competitors who are at least 17 and less than 28 years of age as of Jan. 1 in the year of the Games. Participants must be full-time students at a postsecondary institution or have graduated from a postsecondary institution in the year preceding the event. Canada has a delegation of 122 athletes competing. Netminder Valerie Lamenta (Montreal, Que./University of Guelph) had an easy night turning aside just a handful of shots as the Canadians outshot China 55-5. Lamenta was beaten on a breakaway with six minutes left in the second period when Xin Fang walked in unattended and scored China’s only goal. The line of Mélodie Bouchard (Sept-Iles, Que./University of Ottawa, Kaitlin Willoughby (Prince Albert, Sask./University of Saskatchewan) and Alanna Sharman (Winnipeg, Man./University of Manitoba) was dangerous all afternoon and ended up with nine points in the game. Daley Oddy (Cranbrook, B.C./St. Francis Xavier University), Jaycee Magwood (Killarney, Man./University of Regina) and Kelty Apperson (New Hamburg, Ont./St. Thomas University) also had multiple-point games for the red and white, while defenceman Katherine Bailey (Lucan, Ont./University of Guelph), Alexandra Labelle (Salaberry-de-Valleyfield, Que./ Unviersité de Montréal) and Kelly Gribbons (Port Elgin, Ont./University of Guelph) also found the back of the net. 2015 U Sports national champion Katelyn Gosling (London, Ont./Western University) was selected as captain of the Canadian women’s team. Gosling, now graduated from Western University, is a member of the Canadian Women’s Hockey League Calgary Inferno. She was named a U Sports First-Team All-Canadian in 2013 and Second Team All-Canadian in 2015. Gosling previously helped Canada win a silver medal at the Universiade and has since represented Canada at the Nations Cup with the national development team where she won gold. Gosling was pleased with the overall performance of her squad against China. “It was nice to see so many girls contributing. It was a great team effort,” said the veteran rearguard, one of only two returning members from the 2015 Universiade squad along with Oddy. Serving as alternate captains for Team Canada are Willoughby, Apperson and Jessica Cormier (Cap-aux-Meules, Que./Université de Montréal). Along with goalie Lamenta, they joined the Canadian men’s hockey captains the day before the start of competition to share their love of hockey at a community event in Almaty organized by the Sport Concept Foundation in co-operation with the Embassy of Canada to Kazakhstan. The players held a skills clinic and shinny game with dozens of local children at an outdoor community rink built by Sport Concept, a non-profit organization whose goal is to build hockey rinks and other sports facilities in each district of the city to help make the life of Kazakhstani children better. Canada won the first three FISU Games women’s hockey tournaments (2009, 2011, 2013) before settling for silver two years ago in Spain after losing to Russia. Canada will be back on the ice Monday against Great Britain, before wrapping up pool play on Wednesday versus host Kazakhstan.